Today, more than ever, is the time to think of ways to be "energy empowered" by being less dependent from the grid or to pollutive, expensive diesel generators. 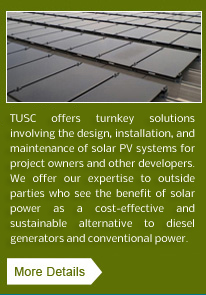 Whether you are a home or property owner, building developer, or warehouse operator, TUSC encourages you to study the tremendous potential of using rooftops, car parks, and idle open spaces for generating solar power --- which can lead to electricity bill savings and, eventually, revenues once the “Net Metering” scheme is implemented. As a systems integrator, TUSC offers expert advice on how to produce your own whatever your starting point or project phase. We help you realize your goal of being energy empowered by maximizing the potential of your property. 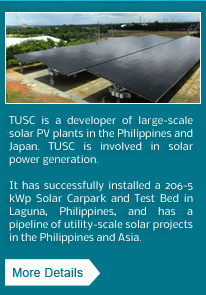 Given the rapid development of solar PV technology and the abundance of sunlight that the Philippines receives, it is clear that solar PV has become economically competitive. As installed costs continue to decline, grid electricity (e.g. Meralco) prices continue to escalate, and industry experience (construction, installation, interconnection, among others) increases, solar PV has arrived at a point that it can compete with conventional sources of power. In 2012, the Levelized Cost of Electricity of solar PV, which measures the cost of generating electricity from the solar PV system, including all costs over its lifetime such as initial investment, operations, and maintenance, is already lower than grid power. And as grid power continues to increase, so will the savings due to being "energy empowered" increase. 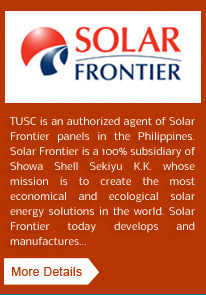 Therefore, it makes sense --- economically and ecologically --- to produce your own power through solar.